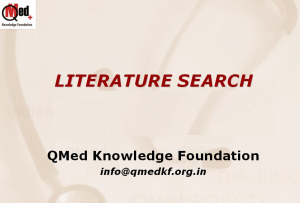 Research Methodology workshops are being held pretty regularly in medical colleges. The Topiwala National Medical College, TNMC for short holds their share every year, both for PGs and for the faculty. I have been a regular invitee as a speaker for the last few years. This year, something was different. More about that soon. The hall had approximately 100 participants. While there were registered participants, the college had allowed other faculty and students to attend specific lectures they were interested in. 1. Could you explain MeSH and Major once more? 2. When we search, we often find important references to old articles. How do we get the full texts of these? Answer: I am making a stress on an important advocacy by QMed for all of you. Several of India’s medical libraries have a rich back volume collection that are lying in cupboards. Only when all of you ask for easier access to these, will a good strong Inter Library System evolve. We at QMed will be very happy to guide this. We are also advocating strongly for all of you to have the PubMed’s LinkOut activated for your library collection. Once created and activated, you can easily find out which library in India has the article that you are looking for. If we do not work at the above, the option is to pay $30 per article to a vendor! 3. In PubMed we find good references that have no full text links. How do we get these? At the end of the talk, came what was different. I was surrounded by about 10 faculty members, some with specific queries, all with adulations (they do still sound good!) but most importantly, with the request to hold full workshops at TNMC. This was definitely music to the ears. This, because I am hoping that with regular workshops the faculty will learn and teach students. This entry was posted in 6 - Old posts and tagged Article Requests, Cochrane Library, Information Literacy, Inter Library Loan (ILL), PubMed. Bookmark the permalink.